Student who killed 10 people at Santa Fe High School identified as 17-year-old Dimitrios Pagourtzis. A high school student accused of opening fire at a Texas high school and killing 10 people on Friday has been charged with capital murder, the Galveston County Sheriff's Office said, according to The Hill. The sheriff's office said in a statement posted on Facebook that 17-year-old Dimitrios Pagourtzis is being held in Galveston County Jail, and that additional charges could still be filed. "The suspect from the Santa Fe [independent school district] shooting scene has been booked into the Galveston County Jail," the sheriff's office said. "He is identified as Dimitrios Pagourtzis, W/M, 17 years of age. He is being held on Capital Murder with no bond. Additional charges may follow." 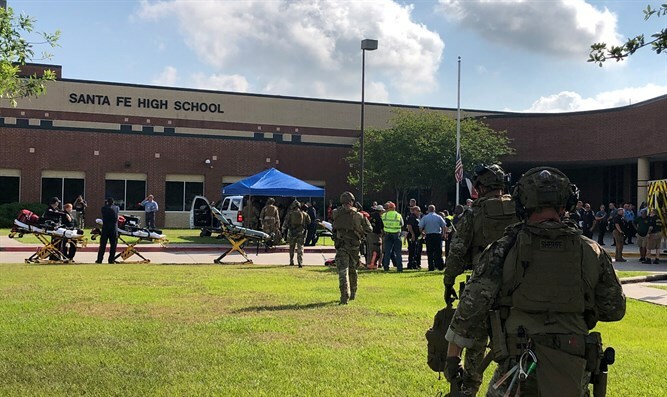 Authorities say Pagourtzis opened fire at Santa Fe High School, near Houston, killing nine students and one teacher and injuring another 10 people. He was taken into custody shortly after the shooting. Another student at the school has been detained as a person of interest, reported The Hill. Texas Gov. Greg Abbott said at a news conference on Friday that Pagourtzis used a shotgun and a .38 revolver that belonged to his father to carry out the attack. He also said that a third person believed to have "certain information" will be interviewed by law enforcement. Police officers responded to reports of an active shooter at Santa Fe High School around 8:00 a.m. CDT. Some reports said the killer walked into the class and said "Surprise!" before he began firing. So far, no motive for the shooting has been announced. President Donald Trump on Friday ordered U.S. flags to be flown at half-staff to honor the victims of the deadly shooting. In a proclamation, Trump said public buildings and military bases should fly their flags at half-staff until sunset next Tuesday.